Aikane and Goofyfoot on a matter of real estate. The dispute about who gets to sit where was quickly settled. 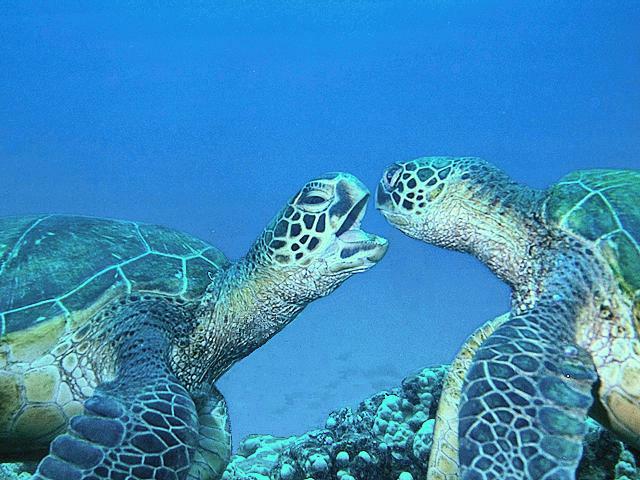 We used to think that the Honokowai turtles rarely show aggression, but once we began watching for this kind of behaviour, we discovered that it is fairly common. They are creatures of habit and like to occupy the same place on the reef, so they will assert themselves to get what they want. Honokowai turtles often crab at each other in order to claim a particular resting spot.